The aftermath of the Great War predominated world events in 1921, notably the failure of Germany to make good on the reparations required by the Versailles Treaty which had ended the war. The terms of the treaty were so onerous that even had Germany’s economy not been crippled it could have paid only a small portion of that demanded by the winners. Threats by the Allies to occupy German industrial centers did much to spur the rise in prominence in 1921 of the German National Socialist Party led by a relatively unknown rabble-rouser named Adolf Hitler. Inspired by Hitler another former soldier in Italy, Benito Mussolini, formed the Italian Fascist Party. 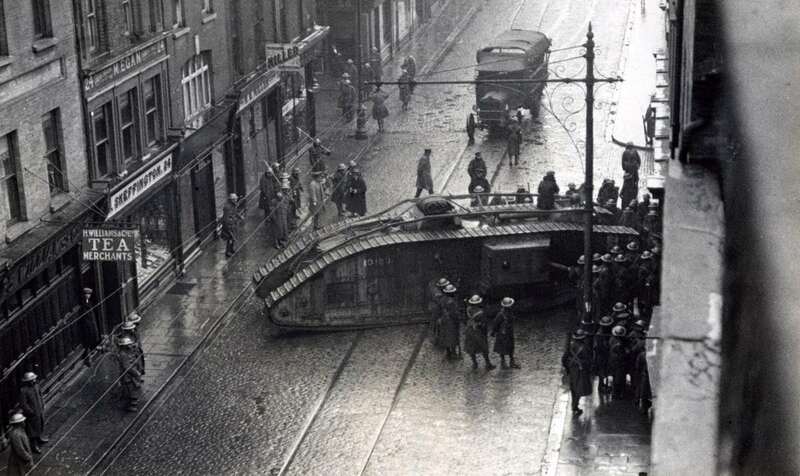 Of more interest to Americans, especially the millions of Irish Americans, was the Irish War of Independence between the Irish Republican Army (IRA) and the British which had been ongoing since 1918 but reached the point of open warfare in 1921 after 8 British intelligence agents were ambushed by the IRA in November of 1920. The reprisals that followed had killed over 1000 people by July 1921 when a truce was finally declared. The British tank above is battering the door of a church in Dublin where some IRA soldiers were hiding. 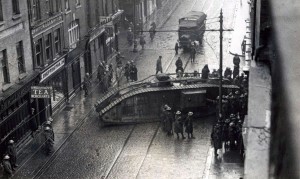 The design of the tank, which appears rather elongated and ungainly, speaks volumes about the Great War. The brainchild of Winston Churchill this weapon was largely responsible, along with the arrival of American troops in 1917, for winning the war. Its length allowed it pass over the barbed wire and trenches which for four years has created a bloody stalemate on the Western Front. Its armor could withstand the hail of machine gun fire which had made it impossible for the defenseless infantryman to advance many yards before becoming a casualty. We don’t know whether the tank or the IRA prevailed in the above encounter but the Irish nationalists did prevail in the political arena. The British reluctantly agreed in late 1921 to partition Ireland with the South becoming an independent member of the Commonwealth and the North remaining part of Britain. This outcome was widely supported by the Irish in America who had backed the IRA financially throughout the rebellion. Only the threat of calling out the troops had broken up a protest by Irish women at the British Embassy in Washington and a week before the cease fire in July 1921 the Irish had closed down 5th Avenue in New York with an enormous parade in support of Irish independence. 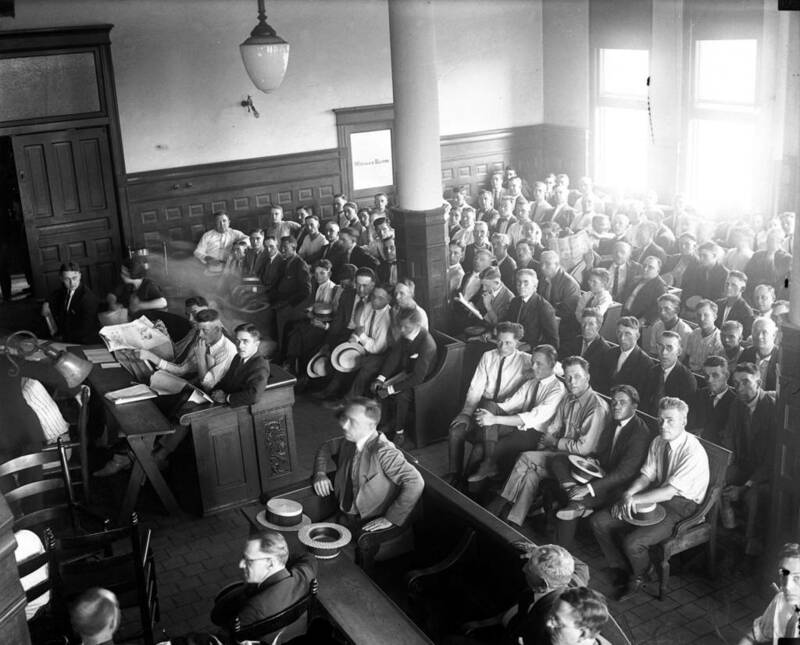 The US in 1921 saw a good deal of court room drama. 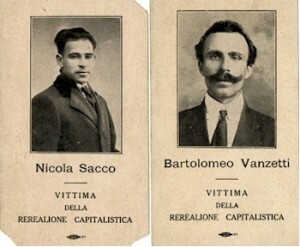 One of the famous and many claim infamous criminal cases in American history ended on July 14, 1921 with the conviction and subsequent execution of Sacco and Vanzetti for the murder of a Braintree Massachusetts shoe factory paymaster and guard. The defendants were Italians and it is believed to this day by many that their only crime was being Italian. Hundreds of books have been written about the case. 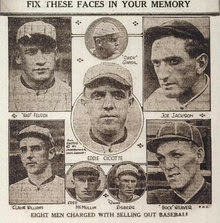 Another court case which captured the attention of the public in 1921 was the trial of 8 members of the Chicago White Sox for fixing the 1919 World Series. It was known as the “Black Sox” scandal. The White Sox were the best team in baseball in 1919, far better than the National League Champion Cincinnati Reds. No one expected the Reds to stand a chance against the White Sox when they met in the October Classic. However rumors began to circulate even before the series began that something crooked was afoot and the suspicions became accusations after the Reds won the Series 5 games to 3. Inexplicable base running gaffs, errors at critical moments and fat fast balls served up with runners in scoring position all confirmed up to the public that the series had been fixed. Eventually White Sox Shoeless Joe Jackson, the best player on the field for either team, and Sox pitcher Ed Chicotte confessed in writing to throwing the series in exchange for a sizable payoff from a notorious gambler. They and six teammates were tried in a Cook County Chicago courtroom on June 27, 1921. The trial was a circus. It was nearly impossible to empanel a jury, cross town rival Cubs fans were excluded because all Cubs fans were assumed to hate the White Sox, the national press fought over seating in the courtroom and the numerous attorneys fought over every point of fact and law with each other and the judge. When the written confessions of Jackson and Chicotte disappeared before they could be be admitted into evidence, Jackson and Chicotte proclaimed their complete innocence and the jury was out only 3 hours before returning a verdict of not guilty. Nonetheless Kenesaw Landis, newly appointed Commissioner of Baseball, banned the eight from baseball for life. A third courtroom drama which made national news in 1921 was the obscenity trial of “The Little Review” a literary magazine for publishing James Joyce’s Ulysses. In the Nausicaa episode of the book Bloom, the chief character, fantasizes about his paramour, the lovely and sensuous Gerty and Bloom, risking blindness, simply loses control. When Joyce describes how Bloom fails to control himself as only Joyce can, the New York Society for the Prevention of Vice was so shocked it pressed charges. One of the publishers of the Little Review and a defendant was the 20 year old Margaret Anderson. 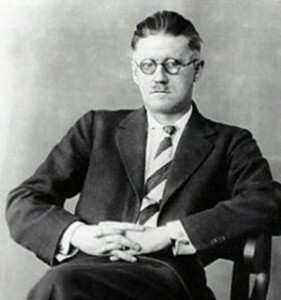 When the prosecutor announced he would read the offending passage in open court, one of the judges objected remarking that such offensive material “ should not be read in the presence of a young woman such a Anderson.” The judges took a recess for a week to read the book in the privacy of their chambers and returned to find the ladies guilty, effectively banning the publication of Ulysses in the United States. FDR, his wife Eleanor, their daughter Anna and sons James and Elliott spent the day on the family sailboat, the Vireo. OnCobscook Bay they went ashore on one of the islands and beat out a fire with pine boughs, then sailed back home. Roosevelt took his five children swimming at their favorite pond, then raced his sons the two miles back to their cottage. Afterward, Roosevelt complained of chills, nausea, and pain in his lower back. He skipped dinner and went to bed. Chills lasted through the night. In the morning, as Roosevelt got out of bed, his right knee felt weak and he was unable to walk it off. 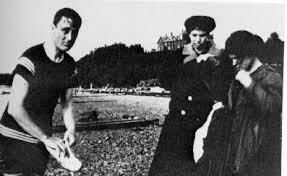 He later told Eleanor he could not go on a camping trip they had planned, and complained of stabbing pain in the back of his legs. His temperature was 102 °F. Eleanor stayed behind with the other adults and the two younger children, Franklin Jr. and John, and sent the older children on their camping trip. As their boat was being packed Eleanor asked the fisherman helping them to speak to the doctor in the nearby village of Lubec and ask him to visit Campobello . Dr. Eben H. Bennet , a general practitioner theRoosevelts had known for years, visited FDR and diagnosed a bad summer cold. By afternoon, Roosevelt’s right knee would not support him when he tried to stand. By the evening his left knee was weakening. Several doctors subsequently examine Roosevelt, included some who were very prominent, but it wasn’t until August 25th that he was correctly diagnosed with polio. The above photo shows from the left Passamaquoddy Chief Horace Neptune, Joseph Nicholas and Joseph Neptune dancing in 1921. We don’t know whether this photo was taken at a ceremony or is a posed photo. The Chief in the photo may in fact be William Neptune as there is an article in the Calais Advertiser on August 31, 1921 which states that Chief William Neptune of the Passamaquoddy Tribe and several tribal members had gone to Secretary of State’s office in Augusta to review an ancient parchment treaty between the tribe and the Commonwealth of Massachusetts dated 1799. Four of the nine signatories for the tribe on the document were members of the Neptune family. 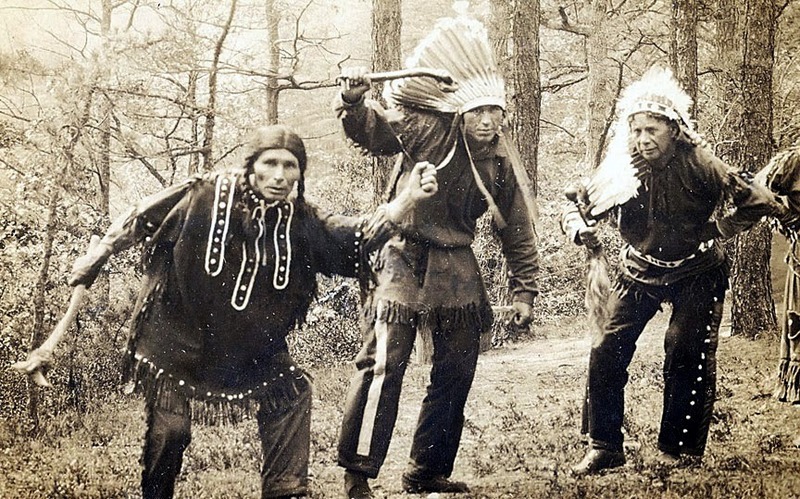 Therein it was stated that certain lands were to remain forever the property of the tribe but according to Chief Neptune “Fifty two lots already have been taken from the tribe…..and were sold to white men for $1 an acre.” and “This seriously diminished the size of the Passamaquoddy reservation which is now about 8 square miles in area.” The Secretary of State vowed to look into the issue. 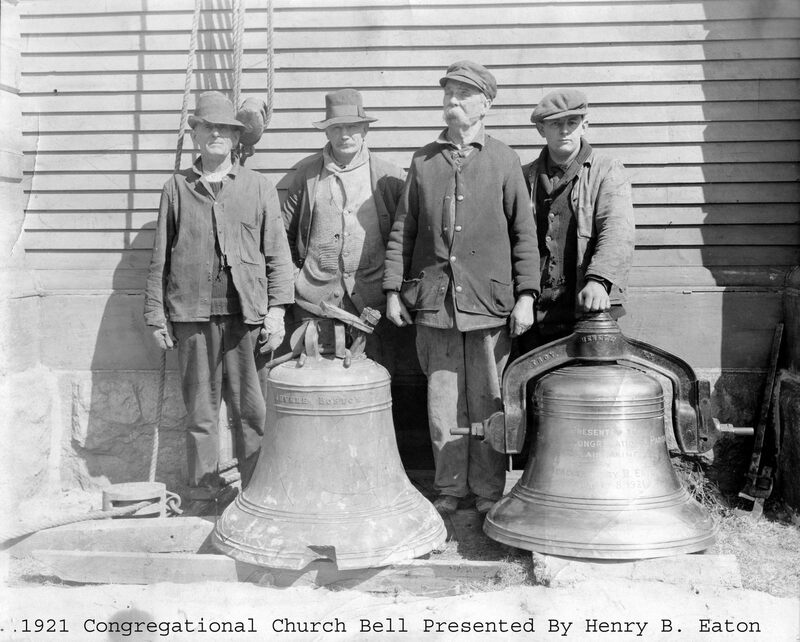 The Congregational Church got a new bell in 1921. The old one was broken and replaced due to the generosity of Henry B. Eaton. According to the St Croix Courier “The bell was tested Thursday evening and the tone is very pleasing.” We note the old bell has “Revere Boston” inscribed at the top so perhaps it was made by Paul Revere. Calais Academy, Class of 1921. Alice Murdock, long time third grade teacher in Calais, is in the front row, third from the left. 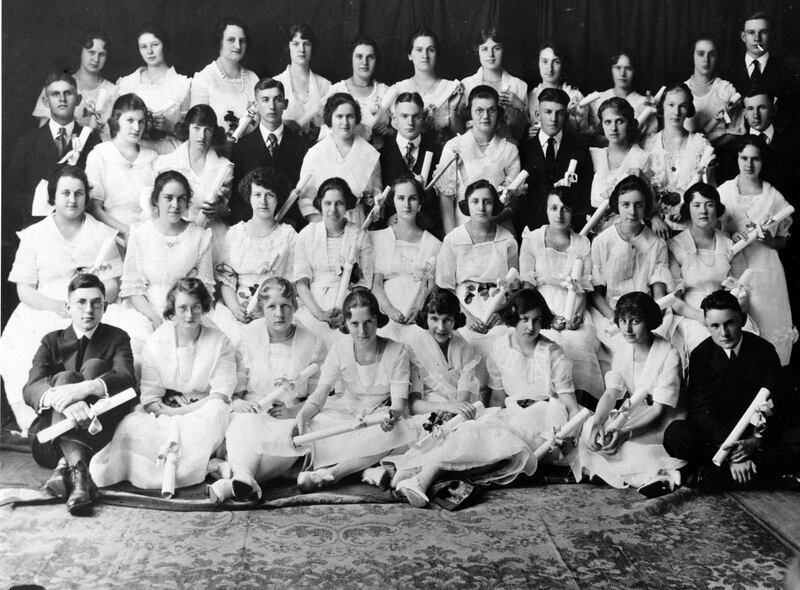 Tillie Gordon is in the second row, third from right. The last person seated in the same row is Pauline Harrington Horton. Theo McLain, one of Calais’ best athletes from any era, is the last person in the third row. Mabel Harmon, another long time Calais teacher is in the back row. She is the sixth person. The person just after her is Geneva Stanhope. 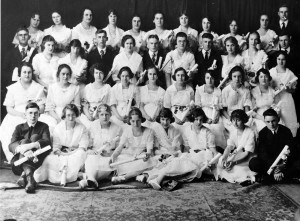 Also in this class were Eva Alley a graduate of Colby College in Waterville, where she received her bachelor’s degree with Phi Beta Kappa honors in 1925. She received her master’s degree from the University of Maine in 1935 and also attended Middlebury College, Nettie Mae Doherty ,Harold V. Jewett, a graduate of Harvard Law School, Myrtle Hill Glidden, Kathy Berry’s mother, Helen Locke Mitchell and Mabel Wade Harmon. 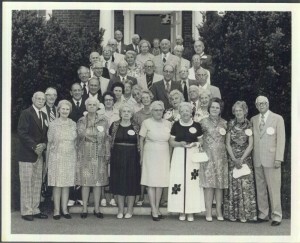 Here are some of the Class of 1921 of them at what we presume was their 50th Class reunion. “ Charles Eaton, Sr., of Forest, bewiskered and very horsy , was driving his steed in a race when the horse shied over against the guard fence and threw Mr. Eaton out of his gig. He was found to be unconscious. He needed something in the way of a stimulant. Someone called out, “Anyone got a little whiskey?” Princeton people were ever ready to help a fellow in need. Up went high into the air an array of whiskey bottles that resembled a WHEATFIELD. That’s the way Maine kept prohibition. In March 1921 Calais revenue agents searched a freight car in the Maine Central yards at Calais which contained, along with the beef hides on the manifest, 1200 quarts of Canadian whiskey. Arrested were Louis and Max Acker of St Stephen and we wonder if they were related to Norman Acker, once owner of the Mecca Hotel. Other interesting news from 1921 included the inauguration Warren Harding, generally a strong contender for the title of “Worst President” , J. Edgar Hoover was named Assistant Director of the FBI and the World Series was broadcast for the first time on the radio. The Giants won the Series over the Yankees 5-3. This was the last year of a 9 games series. Ty Cobb got his 3000th hit and West Virginia introduced the first sale tax. A 16 girl named Margaret Gorman became the first Miss America.